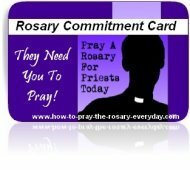 Welcome to the Rosary for Priests Commitment Center. 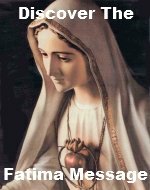 Pray a Rosary for priests that they will aspire "to moral perfection" so as to have "effectiveness of their ministry". This is the intention of Pope Benedict XVI as he proclaims this year, The Year for Priests. It is the Holy Father's hope that this Year for Priests will stress the importance of the priests' role in the Church and in greater society. During these times more than ever, priests need your prayers. We are here to help you get started in responding to the Holy Father's call. And join in on the Year for Priests Support Community by sharing your thoughts on the Year for Priests and by viewing the things other people are doing to answer the call to pray for priests. The following prayers were posted on the United States Conference of Catholic Bishops website and are posted here at the Rosary for Priests Commitment Center with permission for your use. Consider adopting a priest to pray for at the Year for Priests Support Community. Offer a priest or seminarian up for "adoption" there as well. They motivate us all to keep praying for our priests! One last thing before you get on your way. Consider the following points Pope Benedict XVI stressed in his address. He asked for further doctrinal and spiritual formation in priests. So that they will be grounded in the faith and grow in holiness as the years go by. It is the Holy Father's hope that this formation will take place firmly founded in the "Tradition" of the Church, "without breaks or temptations of irregularity". It is Pope Benedict's hope that priests will be "present, identifiable and recognizable both for their judgement of faith, for their personal virtues as well as for the habit". There is so much hope for the future of the priesthood especially after the scandalous behavior in the not too distant past. I would like to emphasize one further point of the Holy Father's. He wishes the distorted promotion of the laity (abuse of Extraordinary Ministers, Communion Services etc.) in response to the priest shortage come to an end. "without (the priesthood) there would be neither the Eucharist, nor even the mission nor the Church herself." A more appropriate course of action would be to investigate the "real causes of contemporary problems linked to the ministry." On that note the importance of this Year for Priests becomes clear. 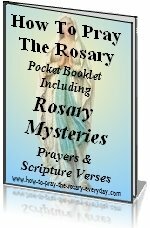 Pray without ceasing especially by using the rescoursed available here at the Rosary for Priests Commitment Center. The peace of the world and your own interior peace weighs upon good and holy priests. Don't forget to pray for the intercession of St. John Vianney the patron saint of priests.